When I was a child, not so many years ago, our local library was in the School of Arts building. I remember dust motes dancing on a slant of sun that struggled through high, grimy windows. I remember the glorious fusty, musty smell of hundreds and hundreds of books, all for ME! I learnt love of reading from a librarian. I learnt that books can open worlds and dreams are found on pages. Without being consciously aware of it at age five, I also learnt that Australia was a lucky country where learning, though free, was valued highly by its people. And that learning and dreaming were freely available in a library. When I became a primary teacher, I met school teacher-librarians. To me, they were the glue that held the school together. The librarian had an overview of all the educational programs in the school, so she could transmit the big picture. She also knew the title of the book that Kenny Jinks had borrowed last week, and could suggest new reading delights to him. Small picture stuff was her forte too, which was so important for the Kennys of our world. A school library is the heart of a school, just the way a local library is the heart and hub of a neighbourhood. We don't need technicians to care for that heart, we need properly trained specialists: teacher-librarians. They have the expertise to teach information skills, and to tie that to every subject and grade. They have a passion for children's literature which they transmit to generations of kids. 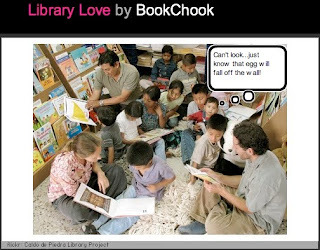 Above all, they have the desire and commitment to teach kids to love reading. When kids really love to read, that spills over to become a love of learning. I don't want Australia to become The Unlucky Country. I don't want our kids to go to schools where the libraries are run by staff who are trained to look after machines. It just doesn't make sense to me that we have national goals for literacy, yet budgets are slashed and library programs underfunded. How can that possibly work? It's not too late. If all of us who care about libraries, learning and the love of reading write to those who make the decisions, we CAN make a difference. I urge you to join me in making a difference to kids' lives. It can be in the form of a letter - just follow the guidelines on the site Susan gave above. I know lots of people care. It's just getting around to doing something that is the crux! The great things is that other people have given guidelines and help at the link in my post above, so it's actually quick and easy! Hooray! Well said. Your experience was much like mine growing up with a love of books thanks in part to the library. Next week is National Library Week here in the States. Seems the issue of underfunding is international which makes me sad. 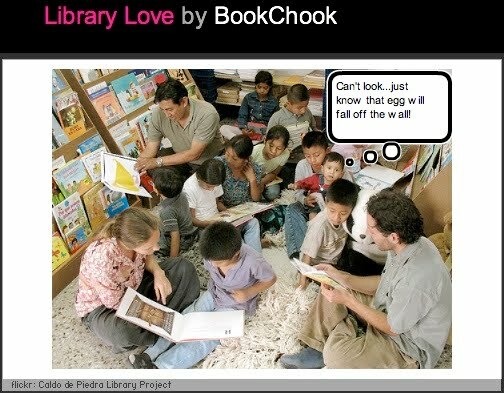 There is a site called Geek The Library (www.geekthelibrary.org) which was funded by Bill Gates and has the right spirit. P.S. - In our Bumble Town forum I provided you some links on how to add pdf's into your blogger blog. I'm not at home atm but when I am, I'll write. It's important. I look forward to it, Kelly. Bless you Molly! I am off to Bumble Town post haste! I have a love for libraries too, they are the glue that hold together a school. I can't imagine a school void of libraries. Fight the good fight. Thanks Kelly. It shouldn't be a fight though, should it? If we all valued education highly, this wouldn't be happening. Are you putting together a campaign or just encouraging people to personally write to the government? If the latter, who should we write to? I'm happy to put my two bobs in. There is a campaign, and you can find out more about it via the link in my post above http://savingaussiebooks.wordpress.com/writing-your-submission-sample-protest-letters/ That takes you to the SavingAussieBooks blog, where you will see sample letters you can write, names and addresses of relevant politicians, and more information. Glad you are putting in your two bob's worth, Kelly! When I think of the dedication and hard work TLs put in, it is you I think of Audrey!